This is a four part look back at the unique design of Safeway stores in Winnipeg throughout the decades. Whether it be circa 1929 or 1965 you could always out a former Safeway store simply bit its look. "Buy your food at Safeway for health's sake.... Safeway protects (their merchandise) in sanitary stores until they reach the consumer. That's why it pays to trade with Safeway where cleanliness in paramount". Another grocer active at the time was Marion B. Skaggs. He opened his first grocery store Idaho in 1915 and by 1926 there were 428 stores operating under the Skaggs name throughout the Western United States. 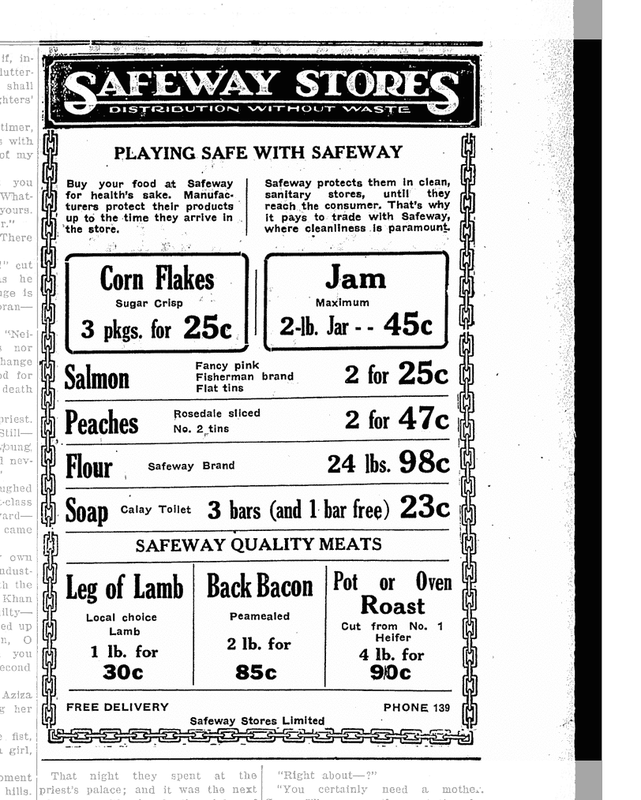 In 1926 Skaggs merged with Safeway and adopted the Safeway name. Marion Skaggs became president of the new company. The mergers continued as the company swallowed up numerous regional U.S. grocery chains. By the end of 1928 there were 2,000 Safeways, though not all were converted to the Safeway name yet, with $100m in sales. A key player in this growth was a man named Charles Merrill and his firm Merrill, Lynch. He facilitated the 1926 merger between the Seelig and Skaggs chains which earned him a place on the Safeway board. The mergers were not, for the most part, cash purchases. Merrill and his firm underwrote many of the acquisitions and in some cases even pre-assembled blocks of stores to sell to Safeway, all in exchange for preferred stock. 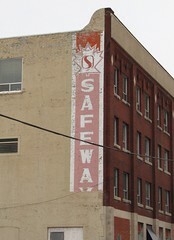 In 1928 Safeway set up a separate company called Canada Safeway Limited. By the time they announced their Canadian expansion they had already purchased land for nine stores in Vancouver and were ready to finalize purchases in Winnipeg. Their goal was to have up to 500 stores across Western Canada within three years. The new company was headquartered in Winnipeg due to its mature and extensive manufacturing and transportation base. Through the 1920s grocery store chains gained strength in the U.S. and Eastern Canada. Local retail organizations and business schools hosted talks about what their eventual arrival would mean for local industry and consumers. 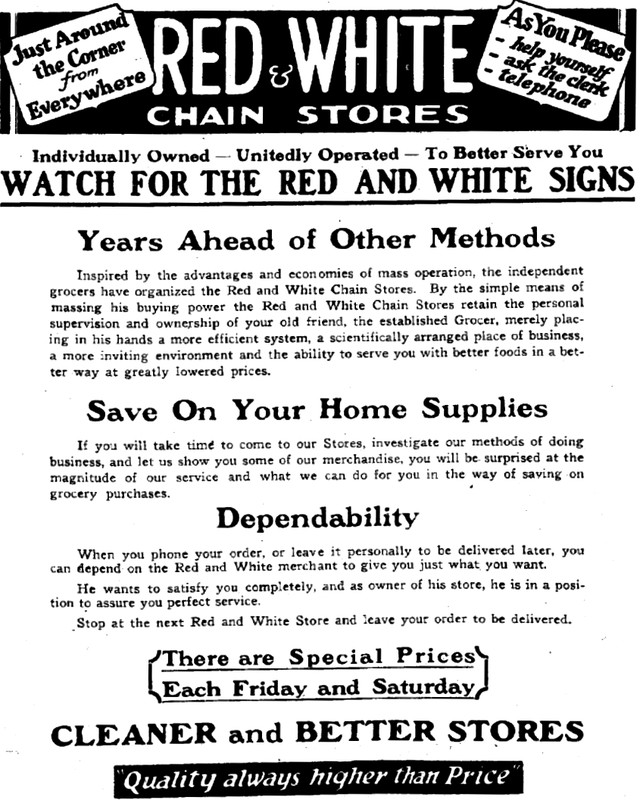 In the mid 1920s a number of local grocery chains formed to prepare for that arrival. 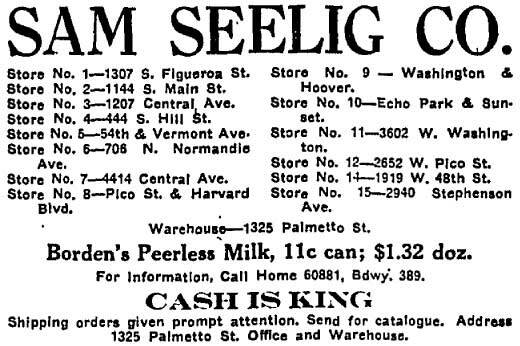 One of the first grocery chains to appear in the city was P and B Stores around 1925. It operated more as a co-op than a true chain as the stores were independently owned and operated, some had been around for years already. P and B was owned by wholesaler Macdonalds Consolidated, the company created in 1914 by Alexander Macdonald that grew into a Western-Canadian wholesaling and eventually retailing giant. The P and B chain stretched across the praries but when Macdonald died in August 1928 the company's board decided to get out of the retailing end of the business. 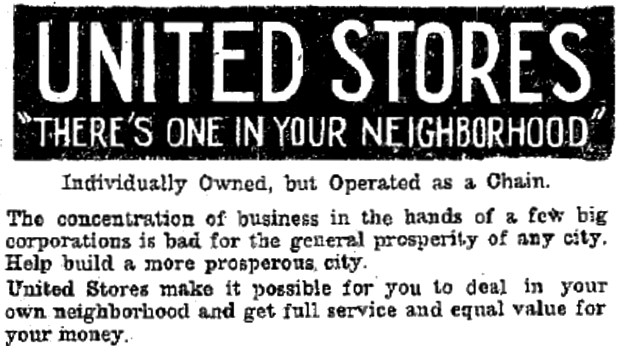 United Stores was a Winnipeg-based entity and wasalos a collection of independently owned and operated existing stores. Owners pooled their buying power and advertising resources. 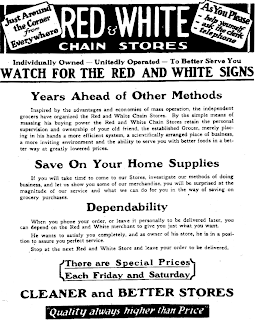 The chain began circa 1925 with about 30 stores and seems to disappear in 1927. 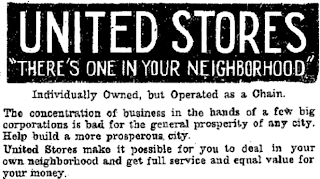 It could be that United joined in with Red and White stores that came to Winnipeg circa 1927.Created by Western Grocers Ltd., it was also a collection of independent owners. Like P and B it operated across the West. It was loosely affiliated with Red and White Stores in the U.S. and another group of amalgamated stores operating in Eastern Canada. Neals stores was a chain that started operating in December 1925 under the guidance of S. F. Neal of Neal Bros. Wholesale Grocers. It grew from eight stores in 1925 to 10 in 1930 and 27 by 1935. The retail chain lasted until 1941, the wholesale business operated until the mid 1950s. With these local chains already in operation, three American giants announced that they were heading to Winnipeg in 1929. They turned the local grocery business on its head in a matter of weeks. The first store to introduce itself to Winnipeg was Mutual Stores, a newly formed Canadian subsidiary of a U.S. chain. They bought out macdonalds Consolidated's retail arm P and B and a four-store local chain called Royal Purple. The owner of Mutual was a holding company called MacMarr owned by Safeway's merger point-man and board member Charles Merrill. 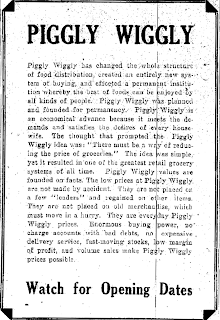 Less than two weeks after Mutual Stores' announcement, American retailer Piggly Wiggly announced that they, too, were setting up a Canadian subsidiary called Piggly Wiggly Canadian Ltd. and opening in Winnipeg. PW was famous in the States for inventing the first completely "self serve" grocery stores. In fact, by this time the chain was already associated with the Safeway parent company. In November 1928 they had purchased the Western U.S. assets of PW. 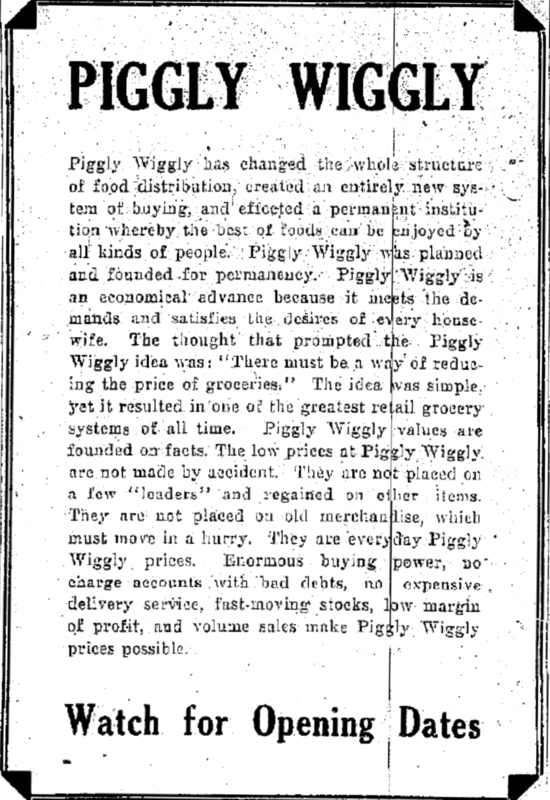 Safeway's introductory ad came in between those of Mutual and Piggly Wiggly's. In subsequent ads under the corporate motto "Distribution Without Waste" Safeway touted their coming stores as having the freshest meat and produce in immaculately clean stores that were safe, well lit and nicely laid out. What local consumers did not know,a nd local newspapers did not report on it, is that the three chains were interrelated through their Safeway U.S.A. parent company and would soon join forces into one retail empire.